This is Lisa’s daughter, Kayla! While visiting the area, she decided to take her senior photos in Gulf Shores. This is a great time to have photos since everyone is relaxed and tan on vacation. She has that summery glow, doesn’t she! Please click the link to see a few more of Kayla’s portraits. 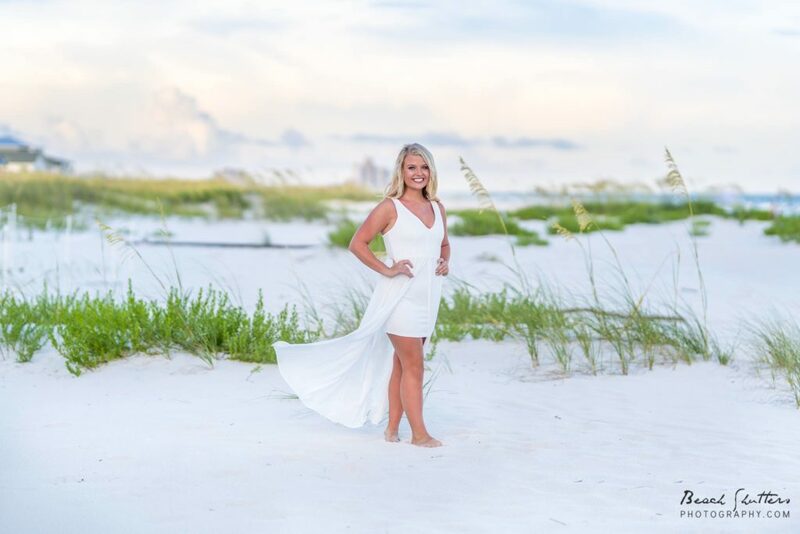 Our beaches make an awesome background for portraits! This All-American girl will have a different look than the rest of her classmates. 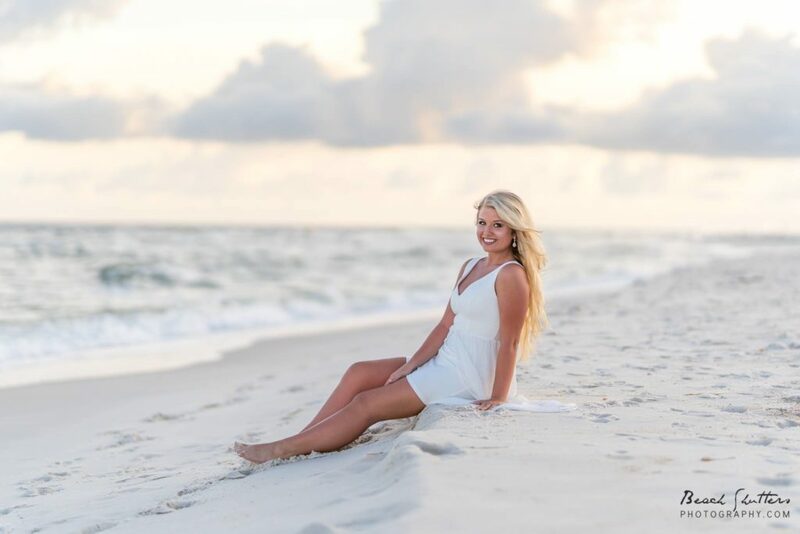 By thinking ahead, and scheduling senior photos in Gulf Shores, she will have special memories from her vacation. 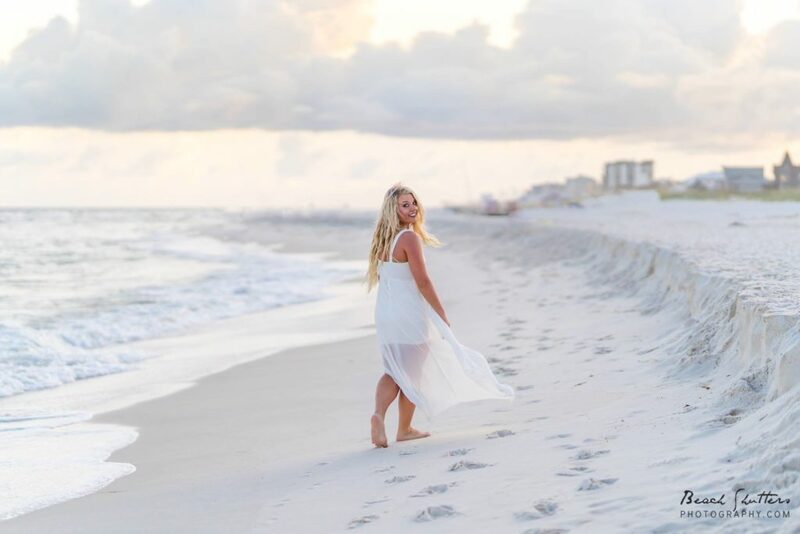 Other photographers can find great backdrops, such as the local fields, barns, or city streets, but unless you live at the beach, this one can’t be replicated. Here are a few tips when planning senior photos in Gulf Shores: What color looks best on you? The beach is mostly muted shades of white, off-white, greens and blues. Any color that you like will look great in front of this background. Wear sunscreen! Sunburn can be edited but can make your skin look orangeish, so take a minute and apply extra sunscreen! Bring props! Sports balls and musical instruments make great props. I am off to bigger things! This is your day, make sure to get plenty of sleep the night before. Make sure your outfit is wrinkle-free, and use a little extra hairspray… the beach is windy sometimes! It can also be a bit hot, so bring a rag to wipe your sweat if needed, and be sure to hydrate before. Hey Parents, jump in for one photo! This is a great opportunity to take one last photo with your child before they are a grown-up! Take advantage of this day to get a quick pic together, it may just be one of your favorites! 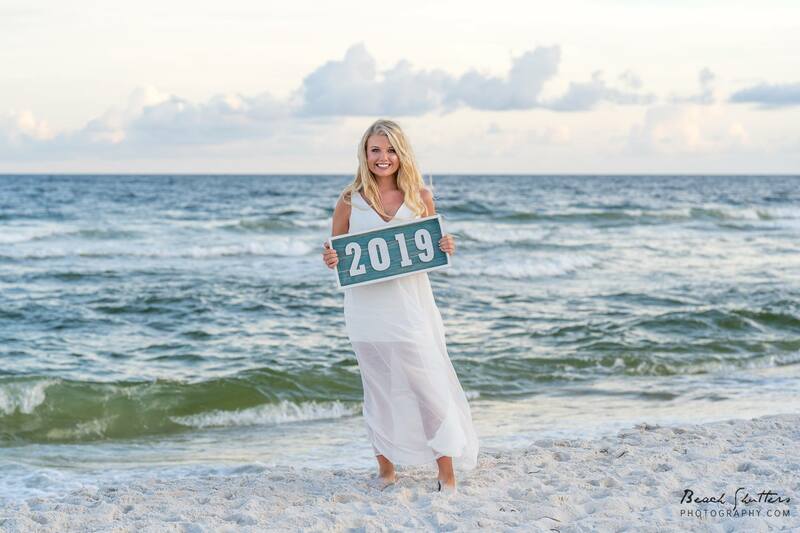 Thanks for reading my post about Senior Portraits in Gulf Shores! I hope you choose Beach Shutters photography for your Senior portraits, family photos, wedding portraits, and real estate photography needs!